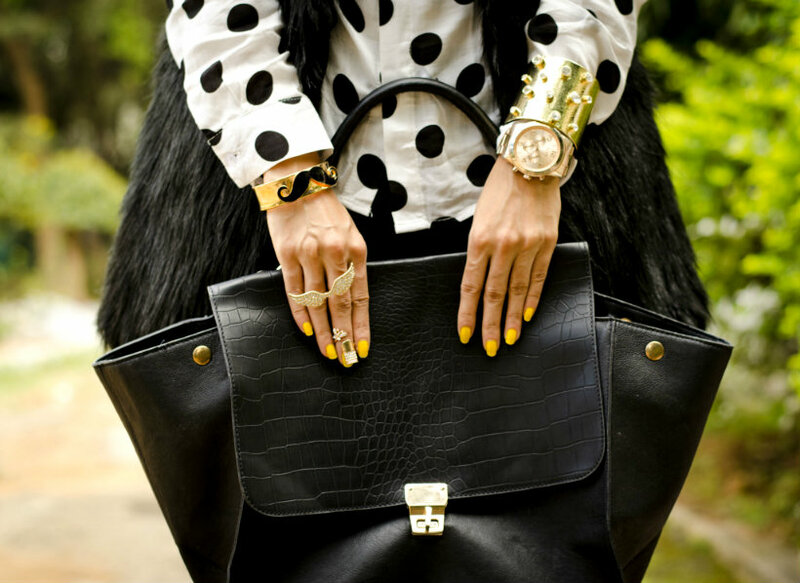 Stilettos Diary: Dots and Fur. Another closet Remix special. You have seen me layer polka dot shirt with blue shirt, print mixing with stripes skirt, now a fall styling with polka dot shirt. The whole point of the remix is to find treasures in your own wardrobe and realize the potential. We girls are never ever satisfied with our wardrobe. Well I feel, we should treasure what we have in our closet and utilize it. It's cool to repeat clothes and bring out your creativity by styling same shirt differently to match your mood and season. I was invited to attend the Orion Fashion Week last month. It was arranged at the lakeside and the event started around 6 o' clock in the evening and went on until 10 o' clock in the night. It gets very cold post 8 o' clock in Bangalore and since it was by the pool side I decided to add layers to my outfit and yet look fashionable. I was excited to attend the event because I finally got the chance to style my fur vest. (I know right?? Of all the reasons to get excited about! What can I say I just love experimenting). Bangalore's weather has changed completely. Its super hot and this time I never felt we had winter in Bangalore! So I ceased the opportunity to style this beautiful fur vest I scored from Romwe.com. Black, White and gold is my the eternal favorite combination. 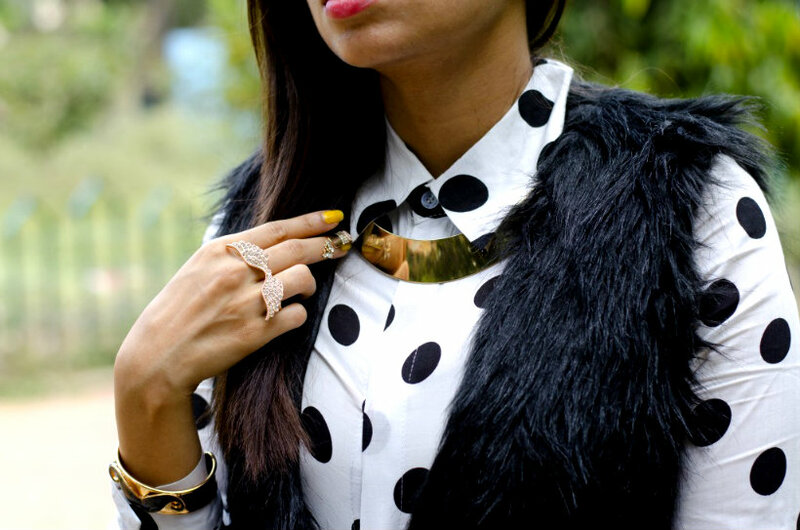 I added a Cleopatra collar necklace and cuffs to add bling to the outfit. Of late I am obsessed with nail rings.Added a nail ring to complete the look. Let me know what you think about the styling. Few snaps from Orion Fashion week 2012. Any one interested in Fashion Photography and would like to shoot for the blog : Stilettos Diary, then please drop an email to stilettosdiary@gmail.com with your name, camera details and links to your work. P.S. Cosmopolitan Blog Awards has been announced. I have worked really hard on this blog and if you think my blog deserves the vote then please vote for me "Best Personal Style Blog" and "The New Blogger" Category. Click on the link to enter your nominations. I love the poka dots!! I like how you paired it with yellow nails. Very nice. 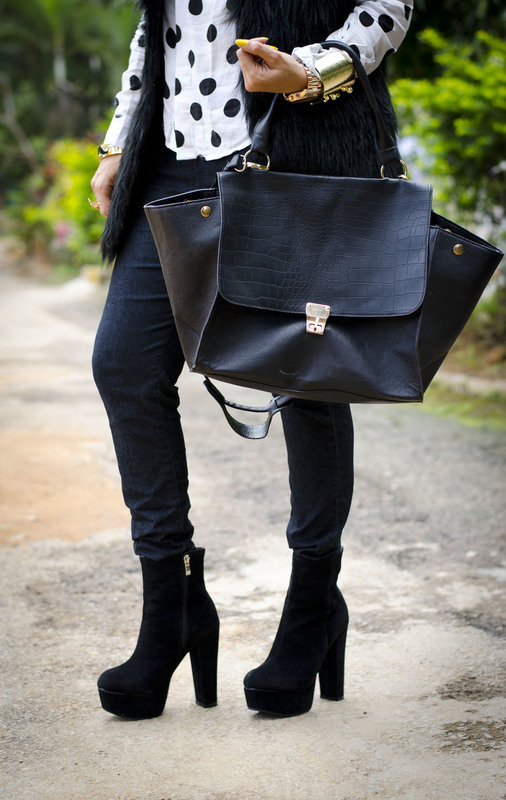 very chic boots and bag!! great vest and dot shirt!! Romwe leggings giveaway on my blog! Very stylish combination of polka dots and fur. So chic. Very stylish! Love the styling! love the entire look! xO! gorgeous outfit! i love that it's black and white and so glamorous! Polka dots are my absolute favorite! I love how you paired them with a fur vest and decided for a chic black and white palette overall. You look just stunning! I wish I wouldve thought of this outfit for myself :) but now I think I'm just going to pull much needed inspiration from it! Love this outfit Megha! Perfect! what a cool styling! you look amazing! loving your fur!